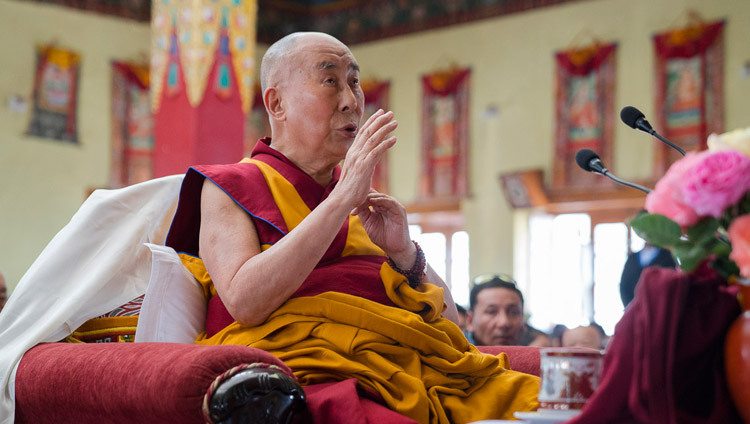 Leh, Ladakh, J&K, India – Under intermittently cloudy skies, which provided some protection from the blazing sun, His Holiness the Dalai Lama drove from the placid Shiwatsel Phodrang where he stays on the outskirts of Leh into the heart of the city. The road was lined with groups of Ladakhis and Tibetans, including whole classes of school-children in their school uniform, who with smiling faces and folded hands were eager to salute him as he passed. His Holiness got out of his car in the Leh bazaar and walked to the Jokhang gate, shaking hands and exchanging greetings with members of the public as he went. He paid attention to the elderly and infirm seated just inside the gate and greeted old friends on his way to the Main Temple. Once inside he paid his respects before the images of Maitreya, Buddha Shakyamuni, Avalokiteshvara and others and took his seat facing the altar. A prayer to the Buddha was recited and tea served. His Holiness noted with pleasure that most of the congregation joined in, reciting by heart, and asked if they also knew the Heart Sutra, which was chanted too. “Year by year, construction and development has taken place. More shops and more schools have come up. Progress is being made in Ladakh. However, in Europe and America advanced material development has only been partially successful because the competition, pride and arrogance associated with such development also brings fear, anxiety and unhappiness. 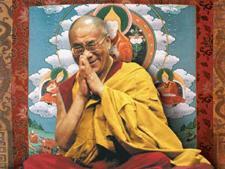 “The world’s various religious traditions all teach love and compassion, tolerance, contentment and self-discipline. They have all brought help to millions. Buddhism too can be summarized in the following verse: ‘Abandon negative action; create perfect virtue; subdue your own mind. This is the teaching of the Buddha.’ Where it differs from other traditions is in its philosophical stance. Here in Ladakh, like we Tibetans, you follow the Nalanda tradition. This takes a scientific approach, examining things through reason and logic. “My Dharma brothers and sisters, you also follow masters like Nagarjuna, Dignaga and Dharmakirti who explained Buddhist philosophy in a reasoned way. They took to heart the Buddha’s own advice not to accept what he taught out of respect for him. He encouraged his followers to examine his teaching as a goldsmith tests gold and accept it only when its worth is proved. A unique feature of the Nalanda tradition is that these masters examined the scriptures and concluded that some could be accepted literally, while others require interpretation. “When it comes to the Kangyur and Tengyur we can categorize their contents in three ways: Buddhist science, philosophy and religion. The religious aspect is only of interest to Buddhists. But the science of mind, logic and philosophy, such as the explanation of the Two Truths, which deal with how things appear and how they really are, can be approached and studied in an academic way by anyone interested, whether they are Buddhist or not.